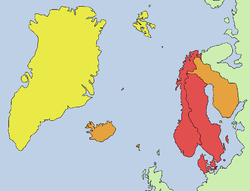 Red: the three monarchies that compose Scandinavia according to the strictest definition; Orange: the possible extended usage; Yellow: the maximal extended usage that takes Scandinavia as synonymous to the Nordic countries. Iceland has been battered by the current financial crisis. In October, I read that Iceland was on the brink of bankruptcy. And then Kaupthing, the country’s largest bank was nationalized by Iceland’s Financial Supervisory Authority a few days later. Iceland is not just a block of ice near the North Pole, as one may have thought. No, it’s an entire country, a homeland to 301,931 people. Iceland is also a part of a region of Europe, called Scandinavia. Scandinavia is a group of countries from which some big things have come. Among them, Ikea, the huge chain of furniture stores around the world; the Icelandic pop singer Björk, who made her debut in The Sugarcubes, an electronica group, and later, became a solo artist; Volvo, one of the safest cars on the market; and, the pop group ABBA. As far as groups of countries go, Scandinavia – which today consists of Iceland, Norway, Finland, Sweden and Denmark – is a unique one. It was home to the Vikings from 793 – 1066 AD. They were as barbaric a people as any in the earlier centuries; they raided Saxon-England and killed many. You see, they were running out of land. If you were to fast forward about eight centuries, you would see that a Viking daughter would still not be able to inherit anything from her father when he died. Everything went to the sons. It was a slightly different scenario for the Viking boys during 1000 AD. When a father died, only the eldest son inherited his land. The younger sons got nothing. Well, they needed land to build their houses, right? So, what did they do? The simple solution: steal foreign land. And since England is close to Scandinavia, why not start there? Over in England, William of Normandy had discovered a whole group of countries that were – gasp – not his. He wanted to conquer Scandinavia and make it his own. Understandably, the Vikings did not welcome him with open arms. After an intense battle however, William of Normandy won, and that was the decline of Viking rule in Scandinavia. But Scandinavia was not always a united group of countries. Fast-forward again eight centuries, to the time of the Napoleonic War (1803 – 1815) when Sweden and Denmark-Norway fought against each other. 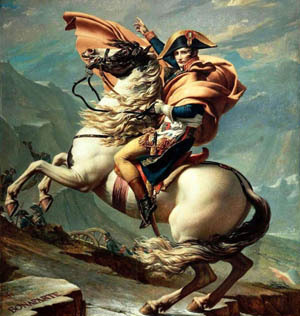 This war was sparked by the French revolution and led by Napoleon Bonaparte. Denmark-Norway were, at that time in union under the same king and they tried to remain neutral. But they had to get involved once their navies were threatened by the British, and they consequently joined forces with Napoleon. Sweden, however, was very active from the start, and very much a part of the war. In 1813, they were promised Norway by the Coalition forces against Napoleon, for joining their Alliance against France. On January 14, 1814, the king of Denmark-Norway signed the Treaty of Kiel, which gave Norway away to Sweden. However, the terms in the treaty were not acceptable to all and an opposition group led by Christian Frederik, an heir to the Denmark-Norway throne, was formed. On May 17, 1814 the Constitution of Norway was signed by the opposition group, and Norway declared herself independent, with Christian Frederik as her king. The Swedish king did not accept the idea of an independent Norway, and a war followed from 27 July 1814 – August 14, 1814. The short battles were won by the Swedish, and the Norwegian king conceded to a peace treaty, which required him to return to Denmark and give up his Norwegian throne provided Sweden accepts the democratic Norwegian constitution and a loose personal union. And so on November 4, 1814, the Norwegian Parliament entered into a union with Sweden. During the First World War, all the countries in Scandinavia remained neutral; however, the war did have an effect on the economy. It took a hit on Scandinavia, as it did the rest of the world. Coming back to the present, Scandinavia is today made up of five countries. Yes, five – Denmark, Norway, Sweden and usually, though not officially, Finland and Iceland. In 2007 Norway had a population of about 4.6 million that spoke mostly Norwegian. However, in some districts, Sámi is an official language, too. The Nobel Peace Prize is presented in Oslo – the only Nobel Prize not to be awarded in Sweden. Sweden’s population of 9 million speak Swedish. The Nobel Prizes are presented in Stockholm, seeing as a Swedish man, Alfred Nobel established the Prizes. Sweden is heavily affected by winter. Every year in January; the city of Kiruna is blanketed in the darkness, and actually gets 0 hours of daylight! Finland’s population of 5.3 million speak both Finnish and Swedish as their official languages. This bi-lingual country makes good use of its 1.8 million saunas. Also it has, 5.2 million mobile phones in use. Nokia, being a Finnish brand, probably had something to do with that. Iceland’s population of 301,931 speaks Icelandic and it is the least populated country in Europe. Despite Iceland’s name giving the impression that it is full of ice and no more, it’s chock-a-block with natural wonders. The midnight sun (apparently there is such a thing and it’s not just a title from the Twilight series) is an amazing light during the night in the summer. I must say that the Finland website had the most interesting information, stating some of the unique statistics about Finland. Scandinavia is very cold, being near the North Pole. Ranging from 5°C to -6°C in just the past few days, it was probably also one of the reasons the Vikings traveled to England, which although cold and rainy, is still warmer than Scandinavia. Information on the Scandinavian countries from http://goscandinavia.about.com/. Other info and pictures from www.wikipedia.com.